...the ice spires of Callisto; Verona Rupes a great cliff on Miranda, a tiny moon of Uranus; the weird sunrises and sunsets of Mercury; the equatorial mountain range on Iapetus; the asteroid Hektor; Herschel Crater on Mimas; the methane seas of Titan; and, of course, the fabulous geysers of Enceladus. – phenomena nominated as candidates for sixth and seventh place in a list of wonders of the solar system. – from the Eudemian Ethics of Aristotle, quoted by Jonathan Glover. 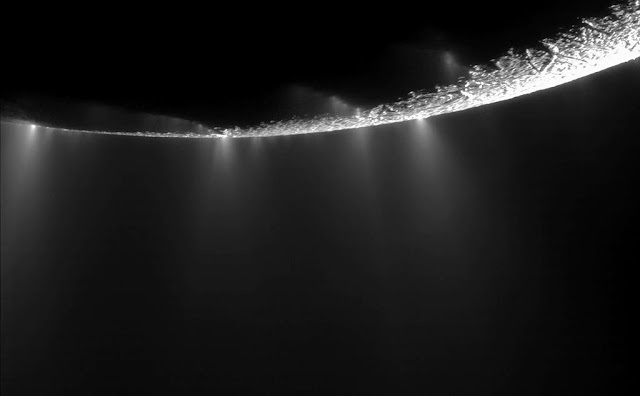 Image: geysers on Enceladus. NASA/JPL/Space Science Institute via wikimedia.